Lots going on! Checkout our new Profile feature. We got mentioned in Fortune magazine, and we're going to EntConnect. You might notice the new profile feature. We're pretty excited about this! We want to make SparkFun a bit of a friendlier place to come. 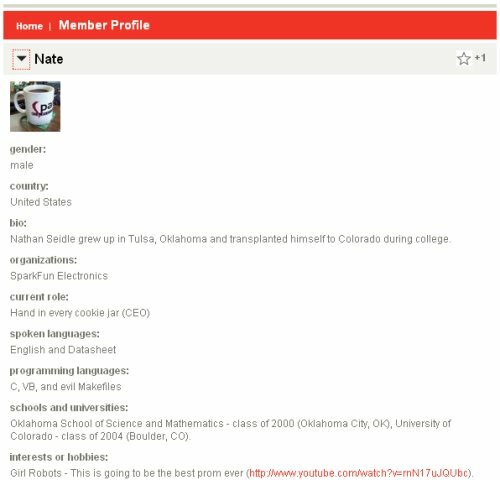 So now you can view the profiles of the people that work at SparkFun, and of some of the users here. If you want - you too can create a SparkFun profile! With SparkFun employees (53? and counting) and countless SparkFun users contributing to comments and feedback, we thought some avatars and profiles would help. Login to create and edit your profile. 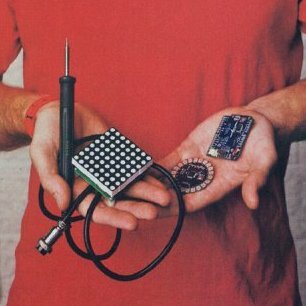 If anyone lives around Colorado and wants to meet up with local entrepreneurs, SparkFun will be attending EntConnect 2009. EntCon is a friendly event that brings together a large group of bright minds. 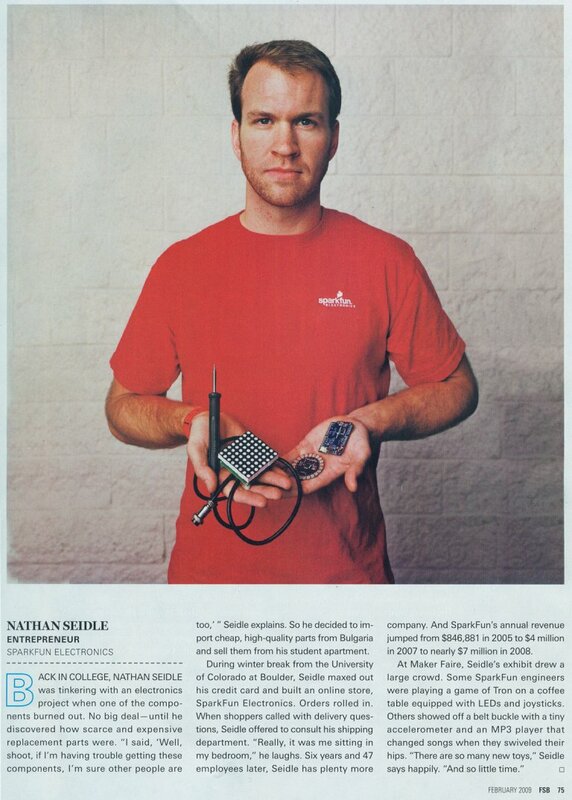 And if you happen to come across Fortune Small Business magazine, February 2009 edition, SparkFun got mentioned in an article! Jessica Bruder did a great job covering Maker Faire Austin and Trujillo/Paumier did a great job with the photos of the Makers. Finally, for the odd news of the day, checkout this helpful flier that I received from Boulder County Treasurer. Property Taxes are due! 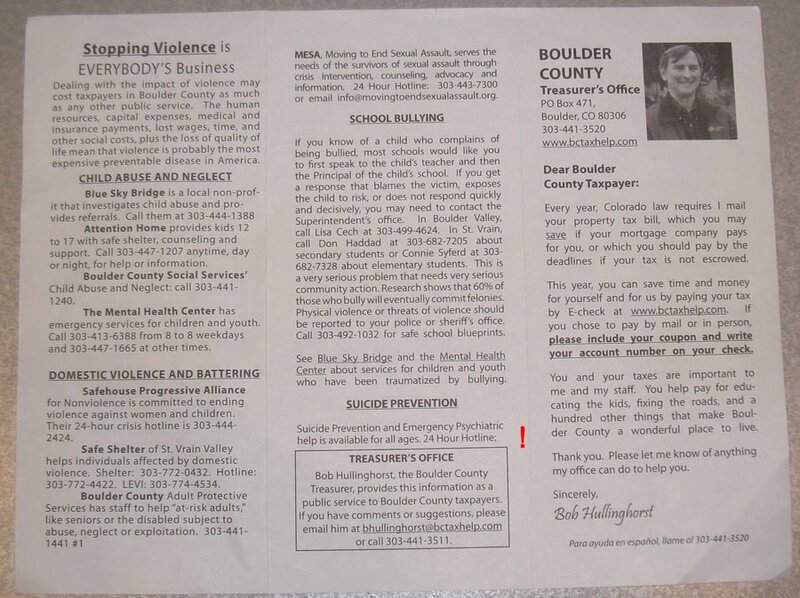 And if you're having problems paying (times are rough), this flier would like to help you with Suicide Prevention - but Boulder forgot the phone number! If you really do need the number : 303- 447-1665. Hi Nathan, Thanks for the shout out on EntConnect which is coming next month. We'll be giving away some great prizes this year and hope to have some SparkFun customers join in the fun. It was great to hear about the SparkFun story from your presentation last year and we all look forward to getting caught up with all the progress you've made over the past year. Congrats on the Fortune Magazine piece! You deserve it for all you are doing for the community. How can I add a plus sign to the text in my profile? Right now it just comes out as a space. If you're pretty sure your image is a JPEG, try uploading it to this mime type detector to see what it truly is. If this page says your file is type "image/jpeg" it should work here. Otherwise, your JPEG is not really a JPEG and it needs to be re-saved as one. This can be done with any image processing program like Photoshop. If the mime detector does return "image/jpeg" and your file still won't upload, please email it to me at it at sparkfun dot com. Our system isn't necessarily perfect so there may be a fixable bug preventing your image from working. Rubi: Maybe it is too large. Even tried it scalled to 60x60, no go. Humm, jpeg don't seem to upload, even though it specifies that it must be a jpeg file. Maybe it is too large. Hmm - we've have a handful of new profiles. Give it another try. If there's still problems, email us at : it at sparkfun.com. I know the IT guys have been watching the site since the new deployment so they're keen to fix bugs. sometimes its obvious when they move the medical examiner next door to your home hahah. yah thats a little obvious. the smell from the reflow oven got to me. ok i was just joking. You guys just keep makin' this place better and better. Filling out a profile is now on my list of things to do. And congratulations on the article:) Ent Connect looks like it's going to be a ball (optional go-cart racing & indoor skydiving!). I'm in California so I wont be attending but it inspires me to check around my area and see if there's anything comparable.